Greetings, and Happy Halloween. Here, we end the annual Horror in October series as a trilogy, capped off by another feature on the witch. This omnipresent character of All Hallow’s Eve stems from iconography that can be traced back through the centuries. Last year we explored the misogynistic stereotypes that aided in forming the iconography of the witch. Now, we have more hocus pocus to discuss! Let us exmine the concept of the Sabbath, or Sabbat. This type of gathering is certainly consistent with all things freaky that occur on All Hallow’s Eve. It is also a concept that appears often in the history of art. As was featured last year, Goya’s portrayal of a witches’ Sabbath was laden with satire and dark humor. Rosa also featured a Sabbath of sorts in his Witches at their Incantations; more of anthology of the iconography of witchcraft to that date than anything else. The Sabbath was a witchy rendezvous at night (obvie) and in the depths of a forest or some other remote venue (obvie). According to the superstitions that date back to the middle ages, witches would transport themselves to the Sabbath by stripping naked and rubbing their bodies with grease or unguent made of the fat of babies that would cause them to levitate. Once airborne and mounted on a broomstick or goat (which was really a demon disguised as a goat), the witches would fly to the Sabbath where they would engage in various rituals of magic, sexual orgies with each other or with demons, wild dancing, worshiping and sacrifices to the Devil, and cannibalistic feasting on children. Many types of conjuring was also believed to take place here in the form of spells to manipulate the weather or to exert sexual power over men, among others. Hans Baldung Grien, of the German Renaissance, was particularly fond of themes of witchcraft in his art. The theme allowed him to objectify the female body while conveying superstitions for the amusement of a male contemporaries, probably upper-class. His witch engravings contain an array of witch stereotpyes, including characteristics of the witches themselves, from the shriveled hag to the smoldering temptress. And these characters can all be seen at the Sabbath. Click image to enlarge. Hans Baldung Grien (German), Witches’ Sabbath, 1510, chiaroscuro woodcut from two blocks, printed in gray and black, 37.1 x 25.5 cm., Museum of Fine Arts, Boston. In the above woodcut, Grien depicts a group of witches gathered in the forest. A trio sits in the foreground over a cauldron which emits an undulating column of smoke and vapors. A deathly looking crone holds her arms up high as she balances a tray containing a bird’s carcass. Above this group, a voluptous young witch flies overhead. She sits backwards on a goat, holding a stick that contains another pot of ingredients as she suggestively balances the stick between her legs. This witch represents the sexual deviance of her kind as shown through her provocative pose with the stick as well as the goat which symbolizes lust. 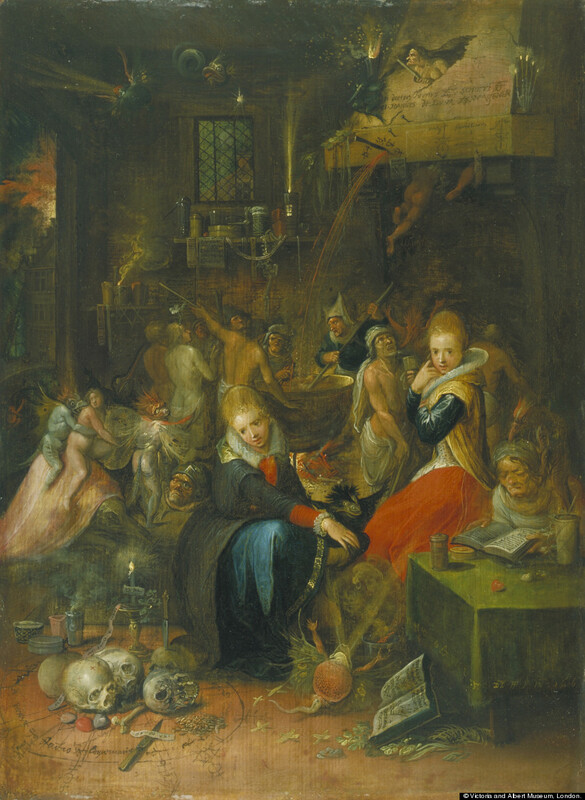 Scattered through the foreground and to the left of the seated witches are numerous tools and ingredients for their sorcery. Most suspicious is the row of sausages hanging to dry under the arm of the seated witch at far left. This is most likely another metaphor for the fear of the witch’s power over male sexuality. A much different version of this subject comes from Frans Francken II. Part of a very famous family of artists, Francken the Younger was known for genre painting. This scene mixes genre with the grotesque. Click image to enlarge. Frans Francken II (Belgain), Witches’ Sabbath, 1606, oil on oak panel, 50 x 63 cm, Victoria and Albert Museum, London. Rather than a Sabbath gathering in the forest or some other remote destination, the group above is in a warm kitchen. The scene is filled with different characters and creatures. The eye is primarily drawn to two attractive women in stylish dress looking out at us. Then the gaze wanders to the other strange activities taking place in the room. We have an old crone sitting at a table looking over what must be a spell book. On the floor a circle of enchantment is painted around a pile of human skulls and other magical paraphernalia. Behind the group in the foreground, an array of demonic creatures jump about to assist in the rituals and general debauchery. A group of witches gather around a large cauldron to prepare some sort of witchy brew. Strange crackling fires and other oozing substances emit from candles and various objects around the room. Through the open door on the left, a large house ablaze with fire can be seen. Could this be the result of one of their spells, or perhaps some mischief on the part of the demons they are in cahoots with? Click image to enlarge. Agostino Veneziano (Italian); after Raphael, The Witches’ Rout, c. 1520, engraving, 30.7 x 64.8 cm, National Galleries of Scotland, Edinburgh. 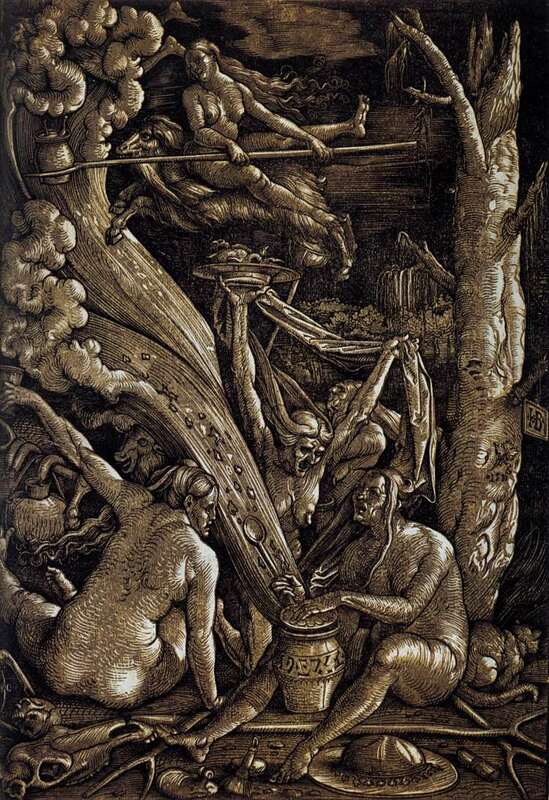 The above engraving continues the traditional iconography of witches as shriveled hags established by Grien and Albrecht Dürer, but adds an interesting twist almost foreshadowing the neoclassical movement. In an image similar to the chariot parades of the Greek gods and goddesses, this scene replaces the deity with an ugly, menacing witch. With an infernal skeleton as her chariot, she rides through a mysterious forest of tall weeds near a pond, as indicated by the flock of ducks that scatter at their approach. Her companions are all children and men over whom she has probably cast spells to worship her. Goats, symbolizing the witch’s lust, once again offer modes of transportation along with another another demonic skeleton. This procession may be headed to or from the Sabbath gathering. Nothing good will come from this parade. Saving the scariest for last, we will once again end with Goya. Goya enjoyed painting themes of witchcraft. He often did so to ridicule the superstitions that established these beliefs. His very last painting of the witches’ Sabbath comes from his late and very macabre Black Paintings. Click image to enlarge. Francisco de Goya (Spanish), Witches’ Sabbath, 1821-3, mural transferred to canvas, 140 x 438 cm, Museo Nacional del Prado, Madrid. This version seems a bit freakier than all the rest. Maybe it’s because of the intense darkness of color and mood. Maybe it’s because the Devil himself is present, in the form of a huge billy goat. Or maybe it’s because of the brooding and irrational mob of disgusting figures. Probably just a combination of all that. These figures gather in a circle around the Devil; most likely they are there to worship him and/or scheme with him, because there are no other objects or witchy paraphernalia in sight. 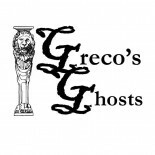 The location, too, is unknown, adding to the secrecy and dark nature of their deed. They look at him with simultaneous trepidation and awe, a pile of figures whose heads and expressions blend together into one big mound. Eventually the eye comes to rest upon a seated figure at the far right, who is clearly separated from the group. She sits with her hands tucked in a muff, gazing at the coven of witches in what looks like an uncomfortable gesture. Could this be one of their new recruits? Or perhaps a victim to sacrifice to the great he-goat? Or maybe she is a young member, regretting her decision to join in such sins? In these Black Paintings, Goya’s most private works which he painted directly onto the walls of his house, one can only speculate. Helen Langdon, ed., Salvator Rosa (London: Paul Holberton Publishing, 2010), 164. Now go drink something witchy to celebrate your Halloween! Kristy: I continue to be impressed with the depth and insight you offer in your blog. I know it is sort of personally risky to put your thoughts out there on the web for all the world to see. Bravo to you, keep up the good work. Where do you get your ideas and information? It must take some time to collect and organize all this. I don’t think that many people would be capable or willing to put the effort into their interests for others to see. Looking forward to the next installment. This entry was posted on November 1, 2014 by KristyDurk in Belgian, Engraving/Woodcut, European, German, Italian, Literature & Mythology, Nineteenth Century, Renaissance, Romanticism, Seventeenth Century, Sixteenth Century, Spanish and tagged All Hallow's Eve, Baldung, Black Paintings, devil, Durer, Francken, Goya, Grien, grotesque, Halloween, hocus pocus, horror, incantation, macabre, magic, occult, Rosa, Sabbat, Sabbath, spell, Veneziano, witch.